Something that’s been an abundantly apparent over recent years is the way in which the vast majority of tax changes outlined and imposed by the UK government have not exactly been particularly favourable to those in higher tax bands. Quite to the contrary in fact as while extensive efforts appear to have been made to improve things for those in lower income brackets, conditions have been getting considerably less agreeable at higher levels. However, on the subject of personal taxation of dividends, recent tweaks could prove to be something of a notable exception to the rule. Asset allocation at the underlying investment level is a concept that has been both on-going and accepted for some time. Recent changes to taxation over the past few years have expanded the same way of thinking to investment wrappers – the combining of the two becoming something of a standard approach for a great many financial advisers and planners. Personal taxation of dividends could be the one thing that goes against the recent trend of on-going tax changes working against higher-rate tax payers, from April 6 next year, dividend payment ‘notional’ tax credits will disappear. This will in turn mean that a tax-free dividend income of up to £5,000 will be on the cards for investors as of then. Dividend income that goes beyond this mark will be subject to taxation at the appropriate rate, in accordance with the respective band it rests in. Even those within the additional rate tax band will benefit to the latest alterations to dividend taxation as of the next tax year. As is the case with all such things however, there are various contributory factors that will influence whether and to what extent any given individual comes out better off as a result of the changes. In this instance, exactly how much dividend income the individual is receiving and their current taxation rate will have the biggest influence on the outcome. As already mentioned, those at the the £5,000 dividend will find things do not change at all for the better or the worse. In terms of tipping points, those paying tax in the basic band going beyond £5,000 will find themselves worse off in the next tax year. By contrast, those paying higher rates tax will only find themselves worse off when dividend levels go beyond £21,667. 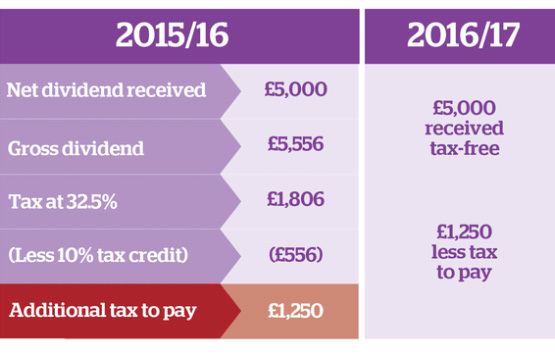 Additional rate taxpayers also benefiting if dividends exceed £25,250. This is precisely where strategic allocation of assets comes into the equation as a means by which to avoid them necessarily paying more tax than necessary. There are a variety of avenues to explore and money-saving possibilities to be discussed – the importance of an independent financial adviser being of extraordinary value for those affected by these changes to taxation.